For the final table setting, I chose a coffee and cake party. 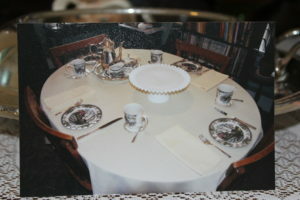 I used the round salad plates at each setting, with the coffee mugs and covered sugar and milk jug set. I also used Great Grandma Mayer’s silver plated Coronation flatware, silver plated coasters under the coffee mugs, Grandma Mayer’s silver plated coffee server and a silver plated bamboo tray with a cherry blossom imprint. At the center is my Fenton Art Glass milk white hobnail cake pedestal. The table cloth and matching napkins are from the other table settings. Friendly Village coffee and cake party table setting.